The DNC, MSM Corruption, plus guest Jay Dyer – ITEL Radio – 7.30.16 | Inside the Eye - Live! Inside the Eye – Live! for Saturday, July 30, 2016 looked at the hypocrisy and corruption of the Jewish owned and controlled “main stream media” (JMSM) as well as the evolution of two different sets of realities: that which is put forward by the JMSM and that which is being reported by the “alternative media”. 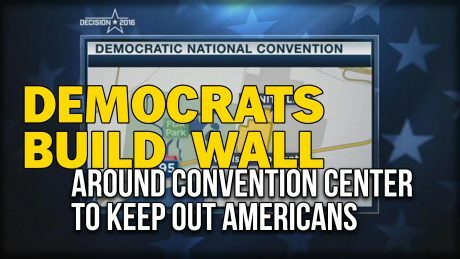 The show also discussed the rather glaring oddity of a Democratic elite which walled itself into a secure 9 foot fenced, police patrolled cordoned “safe zone” while advocating that national borders be torn down and towns and cities across America flooded with non-vetted “immigrants”. In hour 2, Jay Dyer from Jays Analysis made a guest appearance. Topics of discussion included kabballah in film, false flags, “MindWar”, NGO-Intelligence agency collaboration with Hollywood, and much more. The final half hour consisted of a monologue about the nature of truth, light, darkness, and the necessity for each individual to persistently bring a spark of light to their individual corners of an otherwise dark world.